»Expedition To Caves Of Yana! Expedition To Caves Of Yana! Yana is a village located almost 460 km from Bangalore, in the Kumta district of Karnataka. This small village is a place of tourist interest because of its unique karst rock formations. Did you know that Yana houses two enormous rocks composed of solid black limestone?! The rock is black in colour, so the mud on the ground around these rocks is also completely black, unlike the ordinary red/brown mud. The two rocky hills, Bhairaveshwara Shikhara and Mohini Shikhara, are set up against the backdrop of Sahyadri Hills and are completely surrounded by lush green thickets of forests. Yana, with its colour play of black rocks and green forests, with a bright blue sky, is a haven for nature lovers, to say the least! The months of September to February are the best times to visit Yana. Avoiding monsoons are advised since the forests can be dangerous, and the caves hard to trek. Tumkur is a district town, located 70 km from Bangalore. Tumkur houses two main popular spots of attraction, hills of Madhugiri and Devarayanadurga. 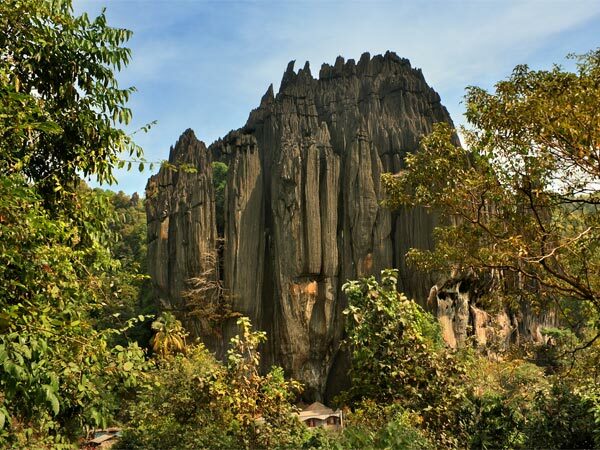 Madhugiri (honey hill) is a single hill and Asia's second largest monolith! This majestic hill is at an altitude of 3930 ft and therefore, a famous spot for trekking. A fort built by Hyder Ali during his reign rests on the foothills of Madhugiri. This fort has three doorways through which the trek can be started. Each trail is about 4 km; carrying a water bottle and some energy bars is therefore, advised. The town of Hiriyur is located about 90 km from Tumkur. This quaint village is home to Teru Malleshvara Temple, a relic of the Vijayanagara Dynasty. It is dedicated to Lord Shiva and has murals that illustrate various scenes from Ramayana and Puranas. Vani Vilasa Sagara or Mari Kanive is a dam built across river Vedavathi in Hiriyur. The dam was built in the pre-independence times and is an architectural wonder considering the time it was built in. The dam is accompanied with a garden which makes it a great picnic spot. The marvellous city of Chitradurga is brimming with heritage sites. It has been ruled by many dynasties, the reason for popular destinations such as Chitradurga Fort, Chandravalli caves, to name a few. The Chandravalli caves are situated several feet below the ground and are nestled in a picturesque landscape of hills surrounding it. The cave houses a temple called Ankali Mutt, which resides between two monolithic rocks. Chandravalli Lake is found nearby, enhancing the overall beauty of the entire place. Davangere is famous for one thing that the entire state of Karnataka remembers for. It is the Davangere Benne Dosa! Made extra buttery, this dish is to die for! Many outlets are found in Bangalore that serve this dosa, but nothing like the original taste of the dish. So do not miss out on this dish at any cost! Blackbucks, locally called "Krishna mruga", were found in significantly high number in Ranebennur. Thus, the region was declared a sanctuary that mainly protects blackbucks in 1974. It protects other animals such as langur, jackal, common mongoose and spotted hyenas. You may also look out for birds such as cuckoo, peafowl, drongo etc. It also houses the Great Indian Bustard, a bird species which is endangered. Haveri is located about 33 km from Ranebennur. The town houses a large number of temples, making it a perfect pilgrimage stop. Of all the temples in Haveri, Galageshwara Temple is one of the popular religious sites. Galageshwara Temple is an awe-striking structure, a classic example of the Chalukya dynasty's architecture. Built in 11th century BC on the banks of River Tungabhadra, the architectural marvel is reflected through the sculptures and intricate carvings of the temple. The town of Sirsi, once called as Kalyanapattana, is 73 km from Haveri. You can find quite a few temples and waterfalls in and around Sirsi. Marikamba Temple, Madhukeshwara Temple, Unchalli Falls, Benne Hole Falls and Sathodi Falls are the popular places of interest in Sirsi. The Yana rock caves are made of crystalline limestone. The rocky hills of Yana - Bhairaveshwara Shikhara is 390 ft while the Mohini Shikhara is 300 ft. According to an ancient myth, the demon Bhasmasura was granted the wish of turning anything he touched into ashes by Lord Shiva. He tried misusing this power by placing his hand on Lord Shiva itself, which infuriated him. A series of events later he was tricked into touching his own head, due to which he turned into ashes, and these rocks are believed to be his transformation. A walk of few metres will take you to a staircase with almost 260 steps. Climbing these steps will finally lead to the black rocks of Yana. The hike to the Yana Caves isn't complete as inside these dark caves, you still have roughly another 900 steps that will take you around the place! This exciting trek might take up to 3 hours to complete; and it is completely worth it. How often do you get to see jet black caves and stand on black soil?! Vibhooti Falls in Yana is a beautiful waterfall, flowing through a picturesque canopy and thickets of green. It falls from the height of 30 ft from the hills of Western Ghats. The name "Vibhooti" is obtained from the limestone rock formations. Located 61 km from Yana caves, Vibhooti falls is also known as Magbi falls since a village named Magbi is found nearby. Trees of bamboo and wild flowers surrounds the falls. The best time to visit is between the monsoon and winter months of October to March, when it is filled with water.